Alison Stewart-Patterson’s climbing career began at the age of 6 in Kamloops, BC. Her father, Iain Stewart-Patterson, sparked her excitement for the sport and despite all the competitive sports Alison was a part of growing up, climbing was the one that stuck. After many years of training, Alison competed at her first WYCH in 2008 in Sydney, Australia. The training paid off and she placed 17th! Since then, Alison has competed in every Youth World Championship that she was eligible for including: Valence, France in 2009, Edinburgh, Scotland in 2010, Imst Austria in 2011, Sentosa, Singapore in 2012 and finishing off in Victoria, BC, Canada in 2013. Throughout Alison’s youth career she also competed in a handful of Pan American Championships and World Cups as well as the World Games 2013 in Colombia. In Colombia, she competed in her first international speed competition placing 15th. She also holds the Canadian Speed Record of 10.83 seconds making her the top female speed climber in Canada. 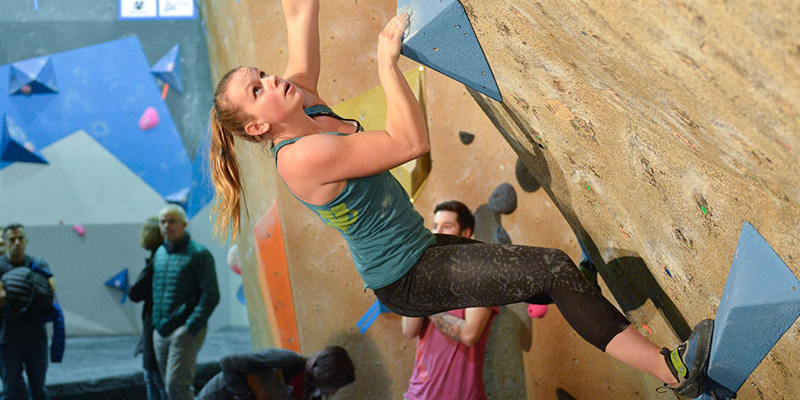 Alison can be found at the Hive Bouldering gym where she is an ambassador, a desk staff, a setter, and an instructor for youth and adult climbers. She is also an avid downhill skier and outdoors enthusiast.